We've reached Week 11 and the playoff picture is continuing to be unveiled. Most of the NFC has seven games to go, and there's still a lot of ways each week can impact the overall landscape. The Rams and Saints are the clear runaway teams in the conference this year. After them, though, a lot of up for grabs both in division races and the Wild Card spots. We're not including Detroit and Tampa Bay, both 3-6, given the strong unlikelihood that they will turn things around. Detroit is the worst team in a stacked NFC North and will likely keep losing, and a head-to-head loss to the Cowboys will be tough to overcome. The Bucs can't decide on a quarterback right now and are going nowhere. The Bears are ahead of the Redskins thanks to a better record against NFC opponents. The Falcons are ahead of the Seahawks and Cowboys thanks to a superior record against NFC opponents. The Seahawks are ahead of the Cowboys thanks to a head-to-head victory. The Cowboys are ahead of the Eagles thanks to a head-to-head victory. The Eagles' tiebreaker loss to Dallas, because it occurs within the division, drops them below the other 4-5 NFC teams automatically. Their head-to-head win over the Falcons this year is invalidated. 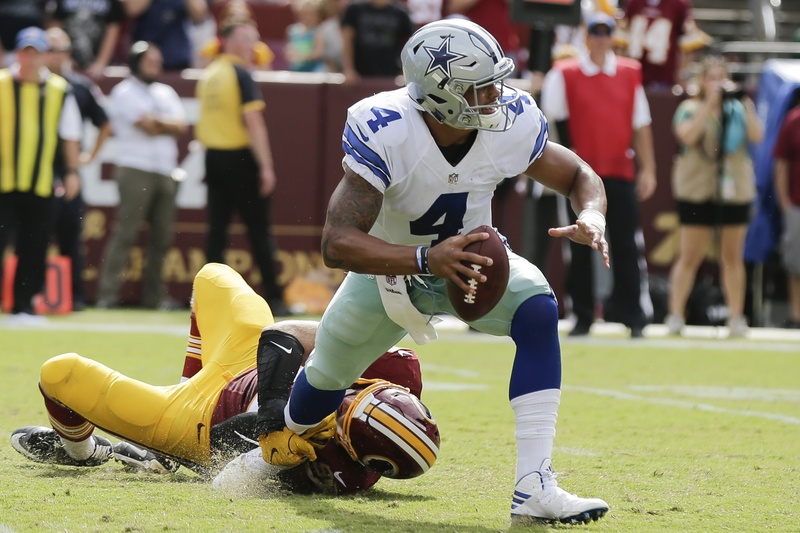 A few weeks ago, I wrote about how winning the NFC East would likely be Dallas only road to the playoffs. That is still the case; the Cowboys are three games behind the Panthers (they lose in a tie because of their head-to-head loss) and two games behind the Vikings for the Wild Card spots. It will be much easier for Dallas to catch Washington, who are more lucky than good with their 6-3 record, than either Carolina or Minnesota. The Cowboys can still hang a loss on the Redskins on Thanksgiving Day, plus Washington has both games with the Eagles left to play. With a head-to-head loss to Seattle this year, Dallas needs the Seahawks to keep losing. Both teams are currently 4-5, and the Cowboys don't need that tiebreaker hanging over them at the end of the year. But a Seattle loss means a Green Bay win, and that doesn't do much to help the Cowboys either. The Packers's tie gives them a slight edge on the 4-5 teams, and that advantage could keep them ahead of Dallas the rest of the way. You could argue that the Packers are a team more likely to make a late-season push than the Seahawks, so a Green Bay loss here could ultimately benefit the Cowboys more than Seattle. It really comes down to which team, between the Packers and Seahawks, you have more faith in the rest of the way. This is obviously a huge game for both teams. Both are 4-5 and trying to stay in the conversation, and a loss here could be a death knell for either. It would also create a head-to-head tiebreaker for the winner over the loser; essentially a two-game swing. The Cowboys won their first road game all season last week in Philadelphia. They have some good vibes and momentum headed into Atlanta, who are coming off an ugly loss to the Browns. Will Dallas ride their positive wave for another week, or will the Falcons be hungrier and enjoy returning home? The answer could be season-changing for both teams. The Texans have won six straight and the Cowboys hope they can keep it going. A Washington loss, coupled with a Dallas win in Atlanta, would narrow the gap between them to just one game. It would also make next week's Thanksgiving matchup in Dallas a chance for the Cowboys to pull even for the NFC East lead. As I said before, the Redskins aren't as good as their 6-3 record indicates. They have only a +1 point differential in 2018, having scored just one point more than their opponents all year. Comparatively, the Cowboys are a +10 despite the losing record. A few weeks ago, the Redskins got pounded 43-19 by the New Orleans Saints. The Texans are arguably the next-best team they've played this year. Hopefully, we'll see a similar result. The Panthers' slipping would be nice for the Cowboys, though they'd have to fall hard the rest of the way for Dallas to catch up in the standings. With the Cowboys having a head-to-head win over the Lions, a Detroit win here wouldn't hurt us nearly as much as a Carolina loss helps. New Orleans appears set on being one of the top two seeds in the NFC this year, which puts them well out of Dallas' range. As such, an Eagles loss is clearly better for the Cowboys in terms of our own playoff positioning. The Packers and Vikings are both slightly easier to catch than the Bears. The best scenario for Dallas is for Chicago to keep winning and take the NFC North, hanging losses on their division rivals on the way and making things easier for the Cowboys in the Wild Card hunt. This one is almost irrelevant from Dallas' perspective. The Rams will probably clinch their division soon and should have a first-round bye. But the Chiefs are in the other conference, so there's absolutely nothing to be gained by them losing. Can QB Dak Prescott Steal Back His Mojo From Atlanta?